Belgium 2210 Facebook page is online. Risk 2210 A.D. - Benelux Championship 2019 announced. O.R.C. Skyfall added to Homemade Expansions. What is Risk 2210 A.D.? Risk 2210 A.D. - Benelux Championship 2019 on September 21, 2019. Welcome to the Belgium2210 site. 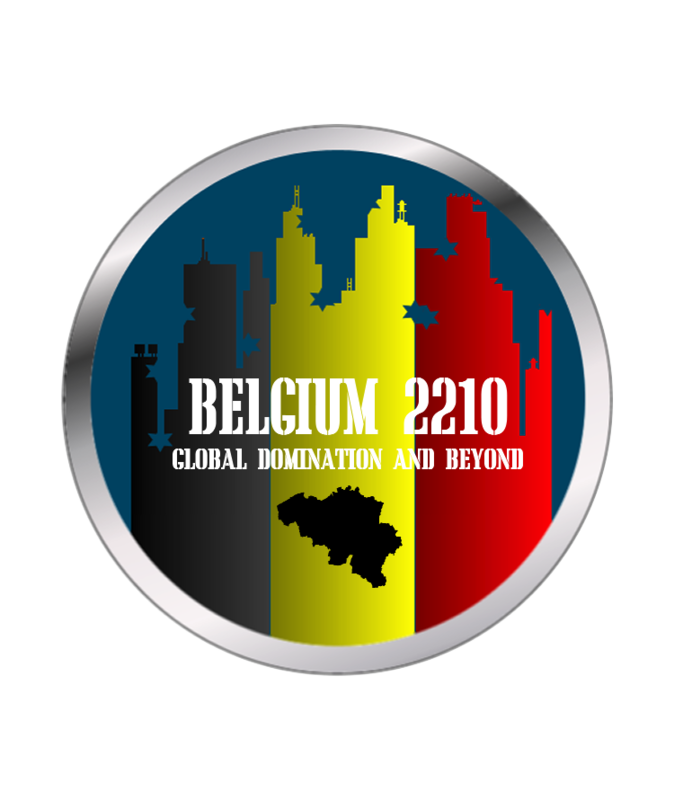 Belgium2210 is a group of game enthusiasts, with a big preference for Risk 2210 A.D.
Years ago, this site was created as overview for players and to organize tournaments. One of the highlights was the European championship RISK 2210 A.D. in Eindhoven (Netherlands). In 2006 we decided to stop the online activities of Belgium2210. Since a while the 'Risk 2210 A.D. virus' started to act up again with Ralph, and we decided to revive the website with a new look. Here you can find our comprehensive FAQ, explanations about expansions and links to other enthusiasts. 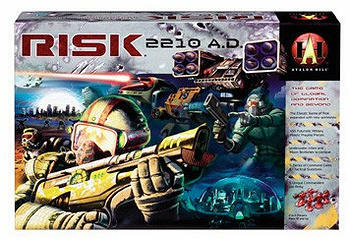 Risk 2210 A.D. is an Avalon Hill Games boardgame for 2 to 5 players. It's a variant for 'classic' Risk, like the Lord of the Rings version. Recommended age is 10+. The designers are Rob Daviau (who also designed Axis and Allies: Pacific, Buffy TVS:The Game and a few Star Wars Games (like The Queen's Gambit)) and Craig Van Ness (who designed a.o. Stratego: Legends, Buffy and Roller Coaster tycoon). Geographically, the map is almost the same as in classic Risk. There are still 42 territories, with (partially) different names however. E.g. Southern Europe is now Imperial Balkania. Also, some connections were removed. But still recognizable if you're used to Classic Risk. At the left you can see Egypt only has a connection to the Middle East. New however are the water territories (13 in total). These are divided in colonies (like continents on land). You can also get bonuses here. Moon exploration is also possible. Just place a space station, hire a Space Commander and go where (almost) no man has gone before. It's important to understand these territories can be alternative ways to reach other territories. Each game is different. This due to the so-called Devastation Markers. These are placed randomly on the board and represent impassable nuclear wastelands. A big change are the Commanders (Land, Naval, Space, Nuclear and Diplomat). These have special functions. Primary they're better soldiers, because you can use 8-sided dice instead of 6-sided (depending on the Commander). The Space and Naval Commander also allow movement to and from water and lunar territories. More important however, you can buy command cards using these Commanders. These cards have a big effect on the game. The cards are grouped by theme (e.g. nuclear cards have a more destructive effect). Deciding which cards to buy is crucial for the end result (certainly since you can only buy 4 per turn). Energy also has a very big strategic importance. You use it to buy (and play) command cards, to buy space stations, to hire commanders. and to bid for turn order in a round. This FAQ is composed from official Avalon-Hill FAQ, RISK 2210 A.D. newsgroups and answers from Rob Daviau, Craig Van Ness and Wizards of the Coast on some mails from Belgium 2210. In any situations where the rules are unclear or ambiguous, it is recommended discussing it with your group and deciding among yourselves how to best interpret the situation to ensure that you can continue playing and having fun. How can I get 8-sided dice, when they're not included in the game? Contact Hasbro (phone numbers can be found at the end of the rulebook). You could also visit any game shop. What if I lose other pieces, like commanders? Sometimes incomplete games are offered on games-newsgroups and sales-sites as replacement parts. What are the 9 blank cards for? Normally there is a note in the box with an explanation. In short: Make your own command cards and use them with the original cards. If I use pictures on the command cards, you can see in advance which cards are custom made and which are original. You can use deck protectors for your cards. You can buy these in every game shop and they protect your cards. The difference between original and custom made cards is almost invisible then. After placing the first MODs (and all territories are spoken for) and the placing of 3 MODs begins: does the player who started the placing, starts again? No. The chain may not be broken. When all territories are spoken for, the next player begins placing 3 MODs. Iceland GRC = Iceland Genetic Research Center. Is there a story behind Risk 2210 and why isn't it included in the rules? Normally the whole story was to be published with the rules, but it had to make place for the rules of classic Risk. The story will surface somewhere. Hint: The story is about 3 persons who wanted to end ALL wars. Read this interview with Rob Daviau for more info. Djibouti is an old French colony. It's pronounced as: JI-BOET-IE. Winning the game: the rules state: at the end of year 5...each player...in turn order. Does this mean that players make the sum of their territories after their turn? Or that everyone (in order the last turn was played) count their territories after the last player has played? And doesn't this give an advantage to the last player? You only score at the end of the game (not at the end of your turn). Yes, this gives an advantage to the last player – keep this in mind when bidding for turn 5 and the use of energy in turn 4. The rules state: Once you have your commanders in place, you may then buy additional space stations (5 energy each). Does this mean you have to hire all commanders first? Contrary to what some forums state, you don't have to hire all the commanders before you can buy space stations. Does a player have to show his amount of energy or types of command cards, when asked? The amount of energy, the number of cards of a certain type is visible for everyone (obviously not the specific cards). Every player may also ask a recount of the territories to get an accurate score. Do you have to shuffle the territory cards, affected by certain command cards (e.g. Hidden Energy, Scout Forces, Scatter Bomb Land...), back in the decks? In the original game, cards are never shuffled or reused. Once a card is drawn it's out of the game. This includes territory cards. Can you build space stations anywhere (e.g. on water or lunar territories)? No, space stations can only be used on land territories. After the initial placing of MOD's, how are commanders and space station placed? Each player will place their two commanders and their space station at the same time, in standard set up order. You don't play one commander, then the next player places a commander, so on and so forth... All three units are placed at the same time. Can energy be saved from turn to turn? Yes, all energy not spent can be used the next round. No. Energy income is determined solely by how many territories you control. Can you sacrifice MODs for commanders when attacking or defending, using 8-sided dice? You can ALWAYS sacrifice MODs for commanders. Using 8-sided dice only means you have to move the commander, when winning. Using 8-sided dice poses no risk for the commander (unless you have no more MODs to protect him). Can a space station be moved after initial placement? No. A space station can never be moved. The manual says all units in a territory with a space station defend with 8-sided dice. Does a space station give any bonus to units that are attacking out of its territory? There is no advantage when attacking. The rules on space stations state that "You still control a territory if all you have in it is a space station." Moving all the units out of a territory during fortification is the only way this can happen (where you move all units to another territory). Is this correct? No. Moving all the units out of a territory isn't allowed. The only way this can happen is as the effect of a command card (e.g. Rocket Strike Land, Evacuation...). Some command cards let players destroy opponent's units (mostly nuclear cards). Can a space station be destroyed this way? No. A space station isn't a unit. It can only be destroyed when a player who already controls four space stations captures another one. There's also a specific lunar command card (Major Destruction - a Risk 2210AD expansion) that allows the destruction of space stations. When is it possible to attack using three 8-sided dice? When attacking from land to water or water to land with the Land Commander, Naval Commander, and Nuclear Commander, and when attacking from land to the moon or the moon to land with the Land Commander, Space Commander, and Nuclear Commander. All three commanders must advance if the territory is captured. There's also a specific nuclear command card (Major Pain - a Risk 2210AD expansion) that allows attacking with 8-sided dice from one territory. Is it legal to roll only 6-sided dice even when a commander is present? If you rolled a commander's 8-sided die during the early rounds of a battle, but then stopped using it and switched only to 6-sided dice during the round when the defenders were finally wiped out, is the commander forced to advance? Yes, this is allowed and can be a smart tactic. If you don't want your commander to advance, then only use 6-sided dice when the defender is down to two defending units. You need a Naval Commander to attack from/to water territories. Do you need a Land Commander to attack into or out of land territories? When a command cards deck is empty, can the used cards be reused and reshuffled? No, used cards are removed from the game. When using the Factions expansion, the Silicon Knights faction to recycle discarded command cards. Can you spend energy to buy command cards and to keep these for later years? Every card not played, can be kept for later rounds. Can more than one Stealth MODs card be played during an invasion? Yes, and other defending cards too (as long as you have the energy). The rules state some nuclear command cards can also hurt the active player. Which cards are these? The Mother, Aqua brother & Nicky boy. Can cards be played with every invasion? Yes, every time the attacking player rolls the dice, a new invasion occurs and more cards can be played. So Stealth MODs can be played every time the dice are rolled. However, if a Frequency Jam is played against the defender, that player cannot play command cards that turn. Does Evacuation work like fortifying, or can the units be moved to any other territory you control? Units can evacuate from the attacked territory to any territory that you control. The two territories don't need to be conneted. If a player is eliminated from the game, does the person who eliminated him get his cards or energy as in 'Classic' Risk? Are there any restrictions on where MODs can be removed to satisfy a MOD Reduction card? Can MODs be removed so only a space station remains? Can you choose to empty a territory this way? You can remove any MODs you feel like losing, even if that leaves a territory empty. You would lose control of an empty territory, however, unless it also contains a space station. Can you play several Colony Influence cards for the same commander at the end of the game? Yes, you play play any Colony Influence card for any commander you still have in play. Does the territory which is evacuated (using Evacuation) still count as contested? Can you remove the last MOD from a territory with MOD Reduction? Yes. Just beware of the difference between MODs and units (Commanders are also units). What happens when Evacuation is played? Is the territory empty? And can the attacker continue to attack? All units are removed from the territory. As Evacuation is played during an attack, the attacker can take the territory without any problem. A space station is not a unit and remains. When playing Hidden Energy, is the Water Terrirory visible to all players, or secret like the Land Territory when playing Scout Forces? Because Hidden Energy does not specify that the Water Territory is to remain secret, it sounds like it should be visible to all players (This is an official WOTC Support answer). Can all attacking units be placed in the won territory, to attack another territory? Yes, this is still part of the attack phase (and an important part of the game). All the water territories are empty at the start of the game. That means the first player can buy a Naval Commander and occupy a lot of them without a fight. Isn't that a big advantage? Why can't they be taken from the beginning? This way, the game starts as classic Risk easily changes. This makes bidding in the first round so interesting. The initial placement of your MODs is also important to capture the water territories. No, at least one MOD or one Commander must be left behind. 'Classic' Risk had a connection between Greenland and Ontario and between East-Africa and Middle East. On the new board these connections (Canada & Exiled States of America and Djibouti & Middle East) are removed. The connection between Canada and Exiled States of America was removed to make N-America easier to defend without making too many changes to classic Risk. The connection between Djibouti and Middle East is also removed, but the reason eludes me - Answer from Rob Daviau. When is a territory occupied? When it contains at least one unit (MOD or Commander) and /or space station. If you own all the available territories of a continent, but one of them contains a devastation marker, do you still collect the additional MODs for owning the entire continent? If you own a water/lunar territory, and the corresponding commander dies, can you put MOD's in those territories at the start of the next turn, or do you have to hire the commander first and wait till the next turn? You can place units in territories you have already conquered (including moon and water territories), even if you don't have the corresponding commander. You can't initiate an invasion from or to any water or moon territories however. The land Commander is an exception: you can initiate an invasion from or to land territories without a Land commander. How can you conquer a territory, when it's completely surrounded by devastation markers? 1. Try very hard to control the territory at the beginning of the game (during the initial placing of MODs). 2. Invade Earth is a (small) possibility. 3. The Tech Commander expansion contains a command card to move through devastation markers: CBN Protection. 4. The Invasion of the Giant Amoebas expansion contains a command card to remove devastation markers: Terraforming. 5. There's also a specific land command card (Major Flˆwerz - a Risk 2210AD expansion) that allows removing a devastation marker. What happens when a territory doesn't contain any MODs and only a space station is left (e.g. after a Scatter Bomb Land)? Does the space station remain? Does the player lose this territory? Does he get a new space station when he re-occupies that territory? Yes, space stations remain. The territory is still controlled by the player. You could own South-America with only 4 space stations and no units. The first player invading the territory gets the space station. So, as long as it is void of units, the territory is controlled by the original player. Can you directly attack from one landing spot to another on the moon (without space station)? If you have questions, remarks or ideas, don’t hesitate to send us a mail. Content and website : Ralph Vloemans & Glenn Seller. Thanks to Walter Muller for the logo.